Growing older has its pros and cons. Most of the pros are mental, most of the cons are physical. When I was a little kid, I desperately wanted a pair of “high-tops” (I didn’t know what else to call them). When I was in second grade, my parents indulged me, but only once. I wore those out quickly enough, and didn’t get another pair. Until I went to college and was living on my own (and, for better or worse, buying my own clothes). Chuck Taylors were the only shoes I wore throughout my college career, and for a long time after. As I got older, I found that my feet had less and less tolerance for the complete lack of cushioning and support in Chuck Taylors. It wasn’t that the shoes had changed (although aficionados will always say “they don’t make ’em like they used to”), it was just one of the cons of getting older. I visited New York City in 2001 and did a prodigious amount of walking in Chucks. After a couple of days, I damn near felt crippled. When I got back to Austin, I broke down and bought a pair of “cross-trainers,” and have worn some variety or another ever since. But I miss wearing Chuck Taylors. I still have a few pair, and trot them out for parties when I know I won’t be doing a lot of walking. I miss the simplicity and utilitarianism, the personality and playfulness. If they came out with a line of Chucks with modern soles, I would be all over them. True fans would complain they weren’t real Chucks. Whatever. It’s a compromise my feet would gladly make. 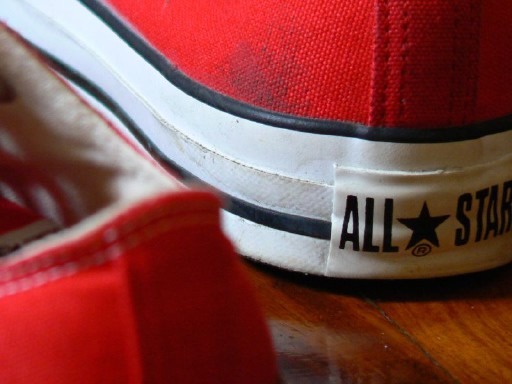 Converse no longer exists as an independent entity anyhow. It’s owned by Nike, which treats Chuck Taylors as a fashion brand and sells them for a premium. The town nearby where I grew up in Massachusetts, still had some of the old mill factory buildings along the Merrimack River. One of them was owned by Converse and housed their factory warehouse store. The term “factory warehouse” means something different today. Back then it really was right there, close by the factory. So, I grew up wearing almost nothing but Converse. I myself was always a “Jacks” girl, more partial to the smilin’ Jack Purcells. But I also haven’t worn them in years. I think that if you buy a good quality insole (like Superfeet in green or orange) and drop them into your Chucks, you could keep wearing them for longer distances. I know it’s not a minimalist solution, but they’ll still look the same on the outside, and your tootsies won’t scream. I grew up wearing red Converse high tops, and was crushed when after living abroad for a few years and wearing the current pair out to find they were no longer being made. Even if they`ve become a fashion brand, I think there`s a little nod to to the past in that they`re still around (or rather, around again) – maybe not a nod from Nike, but from the people are happy to be wearing them, or are familiar with their history.